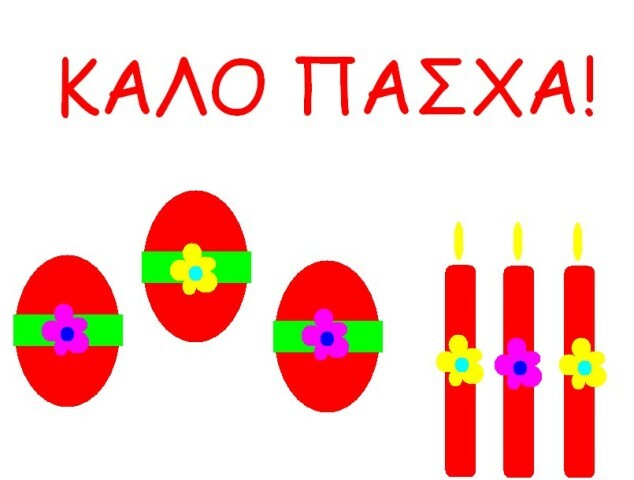 It is difficult to describe the intense feeling of the Greek Easter. There are socially apparent and publicly displayed alterations of mood (from joyous to sad, from elegiac to ecstatic, from lyrical to plainly enjoying good company and food). There is a 50-day Lent preceding Easter, during the last week of which (the Holy Week) everyday life goes by in tune with the commemoration of the dramatic events described in the Christian scriptures. 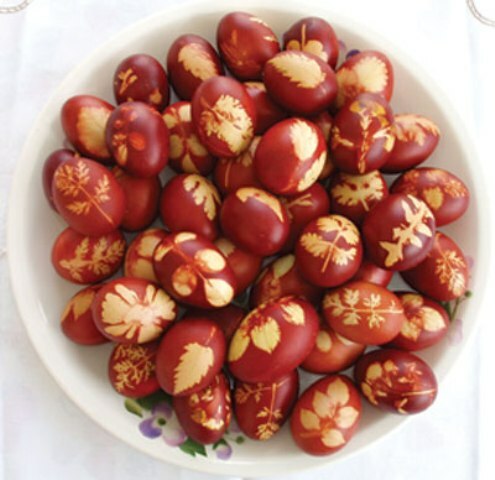 But that too is varied because of regional customs as well as pre-Christian seasonal ones – celebrating nature’s rebirth and the very date of the Equinox are not accidentally connected with Easter. Of course, modernity and urbanization have changed the way Eastertime spirituality is being perceived. Most people nowadays are fasting only during the Holy Week; a lot do not fast; most will not follow the numerous special services performed at church during the entire Lent. Yet somehow, whether religious or not, people are indeed keen into participating into the event, in that it helps bringing communities together. An attempt to purge and revive one’s spirit are significant concepts that relate to observing the fasting – in secular terms, abstaining from animal products (in practice, a vegan diet except from seafood and honey) is more and more gaining grounds for the health-conscious. Finally, related activities in the open air and appreciation of nature in bloom are indispensable elements of Easter tradition for everybody. Paschalia (lilac) is the flower most symbolizing Easter, its name being another synonym for Easter in the Greek language. Pascha is the official name for Easter (passed on from the Hebrew word for Passover). All kinds of seafood, grains, pulses and vegetable dishes become very widespread during Lent. Wine is an essential accompaniment in every case. It is not unlikely to be offered sesame-paste & sugar “halva” in the end of a meal, at homes or as a treat from a tavern proprietor. Here are some of the most famous traditions connected to the season, both local and country-wide. They are all open for everyone to participate. 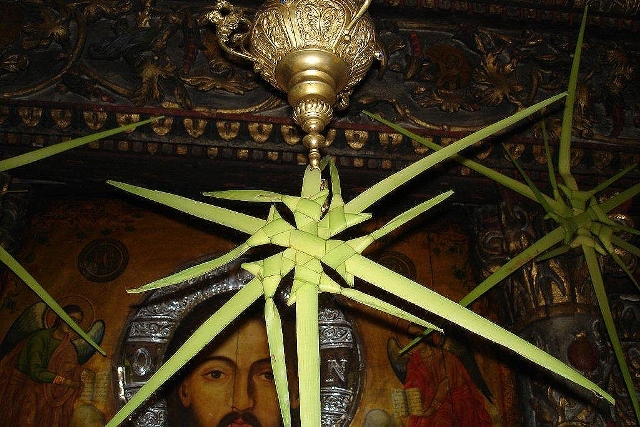 Palm Sunday comes together with the delicate cross-like palm craftwork to be distributed around to people after the mass is finished. The fast is broken and fish gets in the table, some of the most delicious fish-based lunches reserved for this day all over Greece. 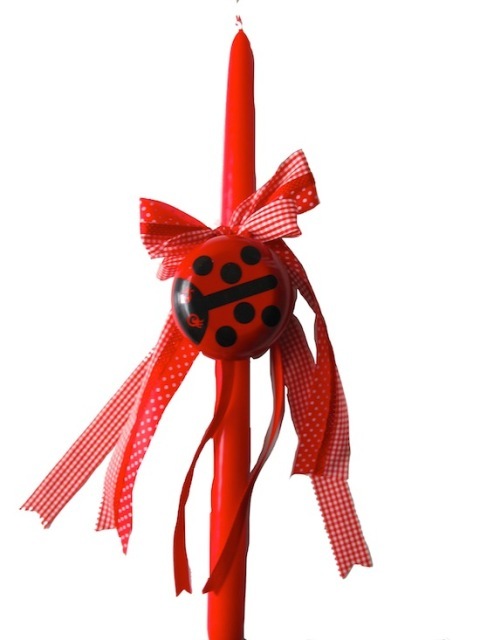 Lampades, a gift for both grownups and children are found in an imaginative variety of themes these days – here are some more traditional ones: the ladybird (paschalitsa or little Easter lady) is a symbol of both Easter and springtime. 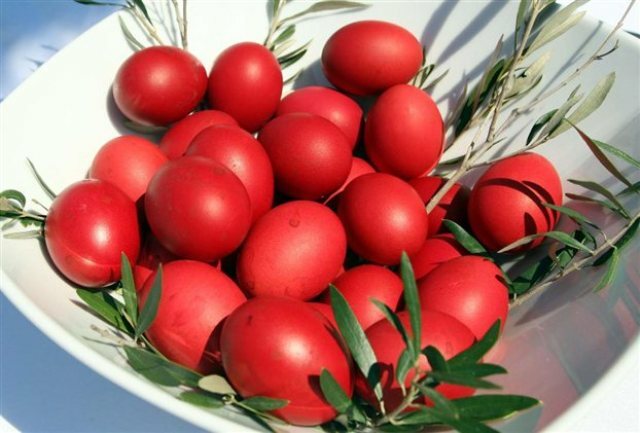 Shrove Thursday is a day to dye Easter eggs in the red color that symbolizes the event of Crucifixion, commemorated in a solemn atmosphere in churches later in the evening. Some prefer the traditional coloring extracted from onion peels and a special decoration technique using natural flowers and leaves. 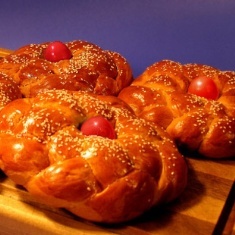 Thursday is also the day for baking tsoureki (the spiced Easter bun), a recipe from Istanbul and found most famously in the city of Thessaloniki. 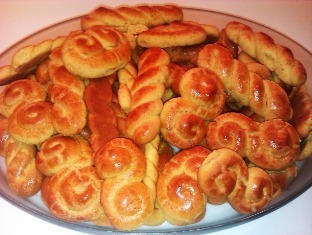 Koulourakia (Easter cookies) are also common, especially in southern Greece. 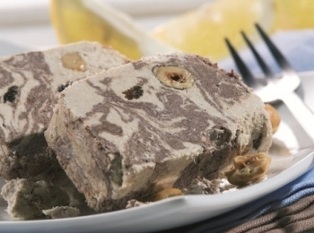 Together with tsoureki they are offered as a gift to friends and neighbors. Good Friday is the first public holiday of the Easter season and a lot of city people travel to their place of origin or generally to the countryside. For those who opt to stay in cities, old-town areas and surrounding monasteries are popular locations for getting into Eastertime feeling. Connecting to one’s roots includes a visit to the graveyard to ornate a family tomb with spring flowers and light a candle in memory of the deceased. 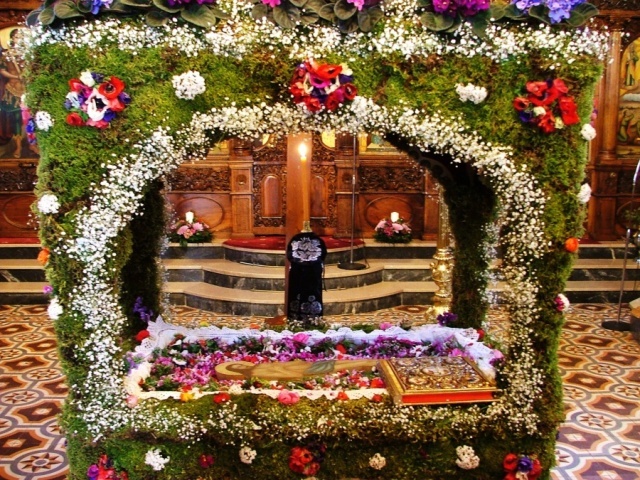 Highlight of Holy Friday morning is the flowery decoration of the Epitaph or Epitafios, symbolizing the burial of Jesus. 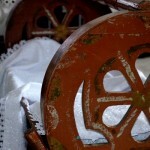 Usually it is an embroidered cloth with the scene of lamentation resting on a wooden miniature tomb. On Holy Friday evening the Epitaph leads a litany of people around the neighborhoods – the procession resembles one of an actual funeral. People hold brownish candles of mourning and chant one of the most moving lyrical verses of the ecclesiastical tradition. 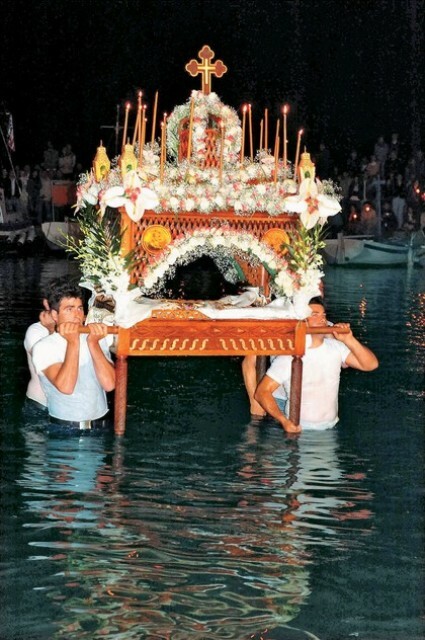 In islands and coastal areas, (often places with a great maritime heritage) the Epitaph gets carried into the sea and tours around harbors aboard caiques. The first to break it is the city of Corfu: at 6 o’clock in the morning, the thunderous sounds and shouts coming from Panayia Xenon church “reproduce” the earthquake that the Bible describes to have happened after Jesus had died on the cross. 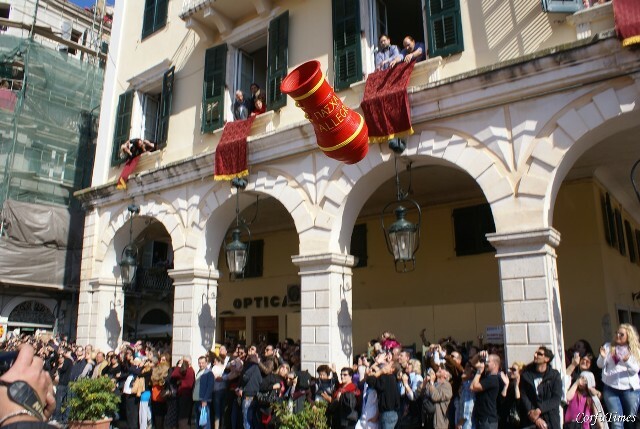 Corfu is most well-known for the custom of the “War of the Jugs” or earthenware pots that are being thrown from the city’s balconies to celebrate the “First Resurrection” celebrated all over Greece on Saturday noon. The special pots (“botides”) are filled with water to produce a louder sound when shattered onto the medieval stone pavements. The “First Resurrection” actually begins in Jerusalem, where the “Holy Light” is lit up inside the Church of the Holy Sepulchre, in a mystic ritual attained by all dogmas of Orthodox Christianity. 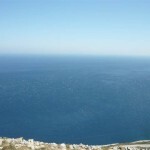 The actual light is transported in a lantern by plane to Greece to be distributed around the country’s churches. A highlight moment arrives around a quarter to midnight, when all lights are turned off, and communities already gathered around churches are left in total darkness. 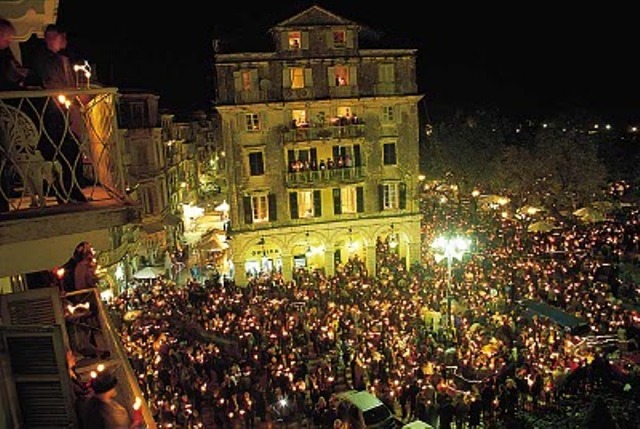 Then, starting from inside the church, the light gets transported from candle to candle, spreading quickly all around… Exactly at midnight, the key-phrase is being chanted: “Christ is Risen!”… or you can guess that, because in Greece you might not get the chance to hear these words at all. 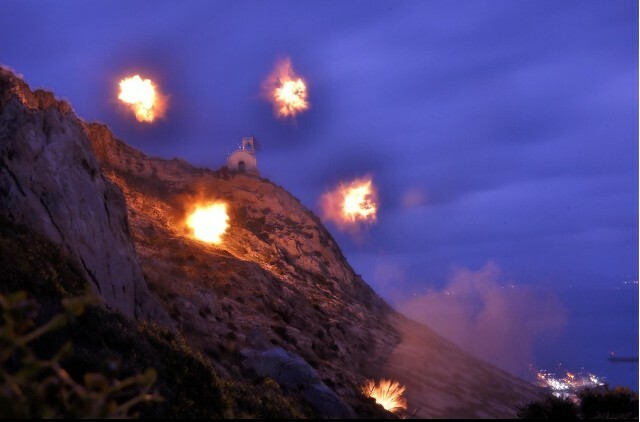 Loads and loads of fire-crackers burst out loudly and continue to explode for several moments, bells ringing non-stop and people kissing and hugging one another, greeting everyone with the same phrase: “Christ is Risen – Hristos Anesti!”. You are supposed to greet back with Alithos Anesti! (truly He is risen!) but you’ll hardly be heard anyway! 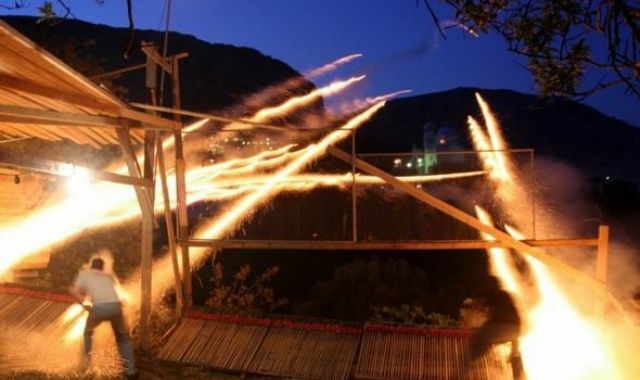 In the island of Kalymnos, the noise is louder than anywhere else: instead of firecrackers, people throw real dynamite down the main town’s cliffs. 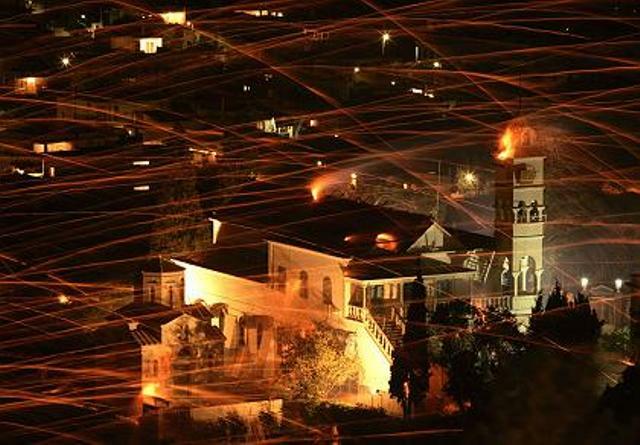 In the island of Chios the “Rocket War” starts between 2 rivaling village congregations that aim at each other’s church bells. The lit up candles are carried to the safety of homes, and a special dinner is set for family and friends. Tradition demands lamb as the symbolic animal for “sacrifice”. At this point enters a popular soup of lamb’s entrails and spring herbs (mayiritsa). 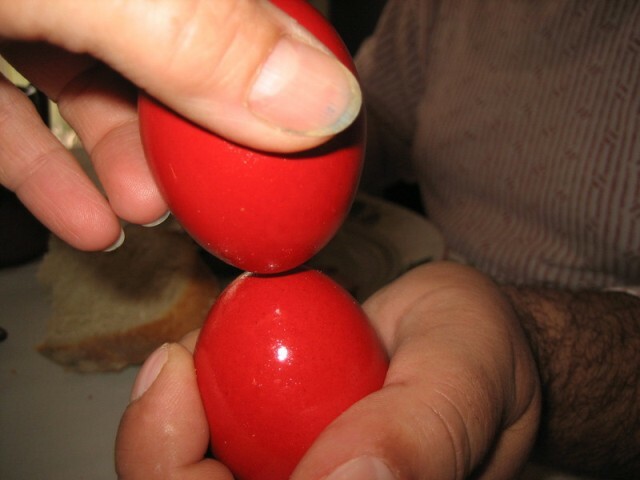 The game of egg cracking usually begins at this instant. The person whose egg is left intact after rounds with everyone is of course the winner. It doesn’t matter if you don’t know the ritual or wishes and replies for this custom (you get the knack as you get along!). Easter Sunday is devoted to celebrating togetherness – and to having fun. 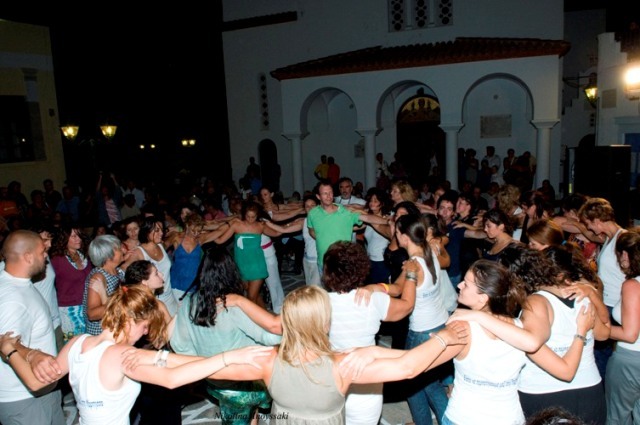 Dance and song al fresco are essential, the Easter event giving one of the best chances to get acquainted with Greece’s versatile folklore sounds, in various dance events in central squares of towns and villages. Each family or community prepare a lamb-based lunch that is always too complicated and time-consuming for people to be dealing with that alone. 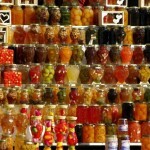 Singing, dancing, drinking and nibbling into the numerous accompaniments is common, so that time passes more quickly before the lamb is prepared and the actual Easter table is set. A merry-go-round of visits to neighbors for wishing and tasting and comparing makes the day even longer. 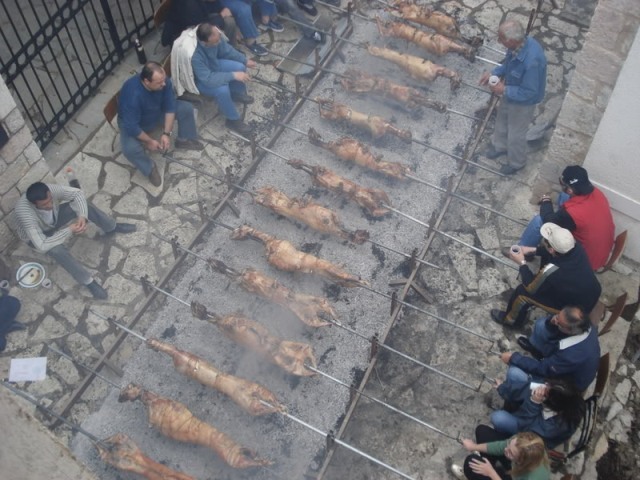 Roumeli region is famous for roasting lamb on a spit, a custom observed commonly in areas of mainland Greece. Men are supposed to be setting up and monitoring the proper roasting – but everyone gets a go in turning the spit around. 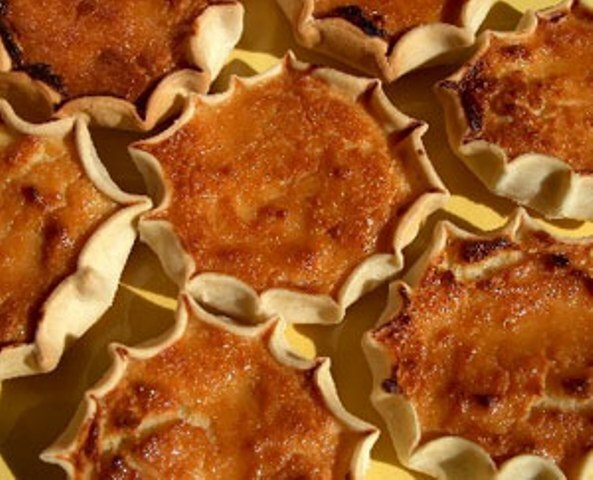 The tartlets with fresh cheese and honey from the Aegean (melitinia in Santorini, kaltsounia in Crete) are a must-try dessert. All sorts of cheese-based goodies are welcome in the Easter table. Easter Monday is the last public holiday of the season (meanwhile, children enjoy their second week off-school). For a change, nothing particular is organized on this day – just a chance to relax and recover, especially for those who consumed more lamb than they should..! 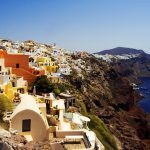 It doesn’t matter which places you chose – the Greek Easter is a unique experience and the best opportunity to really get to know the people of Greece. 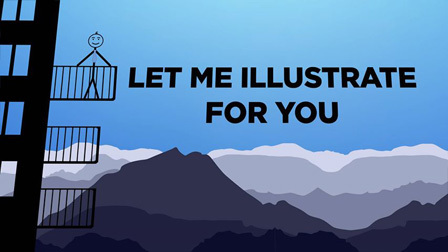 So… we hope to meet you soon! !